I am a curvacious, vivacious gothabilly with a zest for life and a wicked sense of humour! They call me the fairy gothmother round here! I have been a fan of alternative music since the early 80's but I am also completely in love with David Bowie. I am interested in Left wing politics, enjoy British films, particularly Mike Leigh and Ken Loach, and read loads of books. I never know what to say to encapsulate me in a blurb! 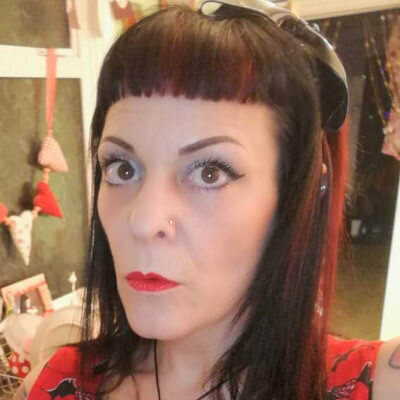 I am a senior Mental Health nurse and I am passionate about mental health issues, breaking the taboo around mental illness and improving treatment and access to mental health support. I like ice cream, scallops and coffee but not necessarily in that order!. I also like to indulge in naps, tats and cats at any given opportunity. I have loads of tattoos and I'm still collecting. I have fantastic friends whom I adore. My favourite local is a bohemian dive with lots of live music, film nights and vegan food-although I am actually veggie (pescatarian really). I'm looking for a meeting of minds not just a meeting of bodies. I love to talk, debate and banter, and there is nothing more exciting to me than someone who stimulates good conversation and makes me laugh. where the hell is the goth category? !